2017 was a tough year. Growing precariousness, widening economic inequality and a political system that seems to abet these destructive trends may leave one feeling disillusioned and uncertain of the future. But another reality is taking shape all across Canada: in the face of these severe challenges, communities and individuals are co-operating to meet their needs collectively. As the conventional economic model fails vast sections of the population, economic democracy and the co-operative model emerge as critical. A Silent Transformation is a film about the hopeful and radical vision of co-operation. When the filmmakers - Simon Brothers, Luke Mistruzzi, Anton Smolski and Mark Preston - started on this project three years ago, they were surprised to find no contemporary films about the role that co-ops play in the Canadian economy. As they soon discovered it is a rich and thriving landscape. A Silent Transformation focuses on co-operation in the Province of Ontario where farmers’ markets and coffee roasteries, movie theatres and credit unions are just a few examples of a myriad of innovative community self-help solutions. In places like London, Guelph, Toronto and Campbellford the seeds of economic democracy and global solidarity are sown. A Silent Transformation is an autonomous and independent project made possible by crowdfunding and the support of institutional stakeholders like the Atkinson Foundation and Co-operatives and Mutuals Canada. AST covers many topics, from the history of co-operation to business conversion to the fight against gentrification. The film is modular in structure so it is easy to isolate sections for short screenings on these topics. Whether you are an educator, co-op practitioner or community organizer, A Silent Transformation can be used to spark a much needed conversation about establishing economic democracy and making 2018 the year of hope and transformation! 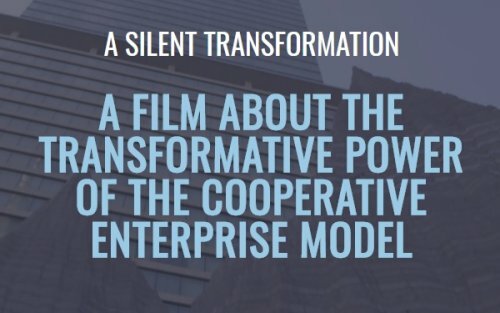 Book a community screening through A Silent Transformation website (www.asilenttransformation.ca) or by getting in touch with the filmmakers at cooperative@powerlinefilms.com. To see if a screening crops up in your town ‘like’ A Silent Transformation on Facebook!